Few data center providers build bigger than Switch. The Las Vegas-based company unveiled plans for its largest project yet, investing in new infrastructure that will bridge Northern and Southern Nevada, in addition to fueling Nevada’s growing tech industry. This $1 billion, 3 million square foot SUPERNAP data center campus on 1,000 acres of land near Reno, Nevada. E-commerce giant eBay Inc. will be the anchor tenant for the SUPERNAP Reno, which will connect to the main SUPERNAP campus in Las Vegas via a new fiber loop, which will also extend to Los Angeles and the San Francisco Bay area. 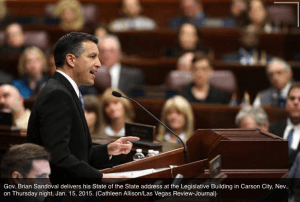 The massive project was announced by Nevada Gov. Brian Sandoval. The SUPERNAP project brings another major hyperscale data center to Reno, which is already home to a large cloud computing facility for Apple. The first phase will feature an 800,000 square foot data center, and is scheduled to open in early 2016. 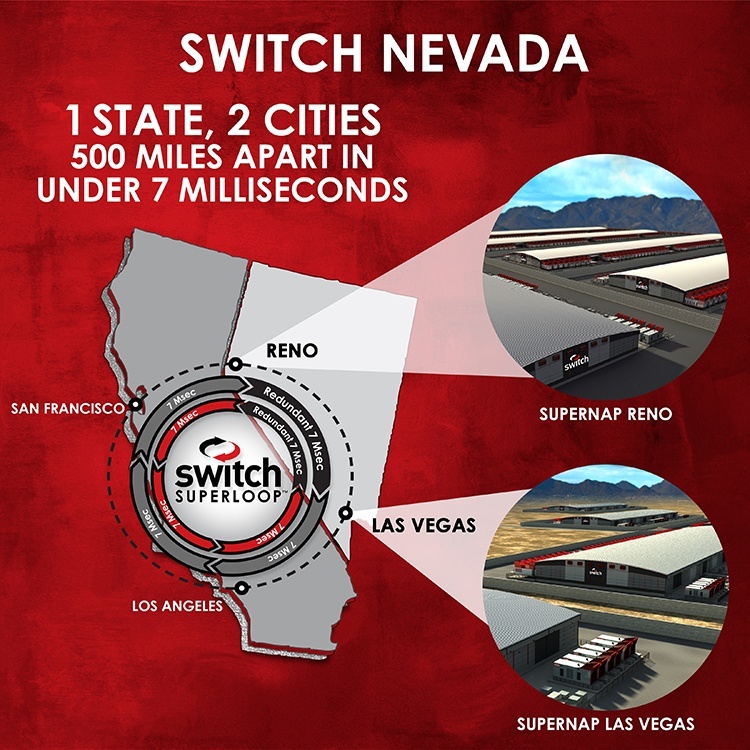 The Reno data centers will be designed to meet the Uptime Institute’s Tier IV Gold rating for both facility and operations, a standard currently met only by the Switch SUPERNAP 8 in Las Vegas. Switch has built a major cloud computing hub in Las Vegas, including two huge SUPERNAP data centers, with a third nearing completion. When the new SUPERNAP 9 opens, the colocation provider will have nearly 1.5 million square feet of capacity in Las Vegas. Switch said today that it will also expand the scope of its Las Vegas campus, where it will develop data centers on an additional 200 acres of land, which land could support more than 1 million square feet of new capacity, Switch said. As it scales up in its core market, Switch has extended its gaze beyond Vegas, announcing plans for an international expansion as well as the project in Reno, which lies about 500 miles north of Las Vegas. A key component of the Reno expansion is the SUPERLOOP, a fiber network that will kick off with a 500-mile route between Las Vegas and Reno. The network will also extend from Las Vegas to Los Angeles and the Bay Area. Switch said the fiber ring that will place 50 million people within 14 milliseconds of data hosted at the SUPERNAPs. The Reno project is welcome news for the state of Nevada, which has been touting data centers as a growth sector as it seeks to diversify its economy beyond tourism and casino gambling. It comes on the heels of an announcement that automaker Tesla will open a “gigafactory” battery plant near Reno. Switch has become a major economic force in Las Vegas, where its construction projects have created hundreds of jobs. Switch now has more than 1,000 customers, including more than 40 cloud computing companies and a dense concentration of network carriers. The company’s roster of clients includes tech industry heavyweights like eBay, Google, Cisco, VMware and Microsoft’s Xbox One. The 350,000 square foot SuperNAP 8 is the latest design from Rob Roy, the CEO and founder of Switch, as well as the company’s principal inventor and chief engineer. It sits adjacent to SuperNAP 7, the 400,000 square foot center that put Switch on the map. Roy has patented many of the design innovations at the facilities, including an advanced cooling system which can switch between six different cooling modes, and the T-SCIF heat containment system. The company is currently nearing completion on SUPERNAP 9, a 600,000 square foot data center adjacent to the existing buildings. Switch constructs its facilities using pre-fabricated modular components known as SwitchMODs, which each feature two data halls. The current design includes flywheels to provide additional runtime on for HVAC units in the event of a power outage, a steel aisle containment system that also functions as a thermal storage system, and a boudle-roof system that protects the data centers from wind speeds of up to 200 miles per hour. The design can operate effectively in any climate, providing a template for global growth.